It's time for an upgrade to the central heating system. 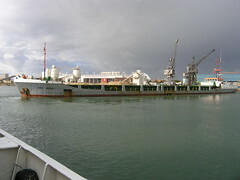 The wheelhouse does not stay as warm as the rest of the heated areas of the boat, mostly because the radiator in there is comparatively small. 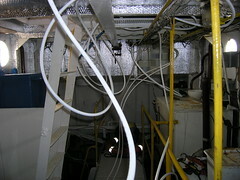 What I'm doing in the picture is installing pipes underneath the wheelhouse deck, so making underfloor heating. The new system definitely works, though I'll need to spend some time balancing up the rest of the system, as now the galley is not as toasty warm as it used to be.. 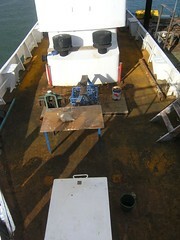 Here's a view of the deck before rust busting started. So far, I've got the whole of the port side chipped, all the way round to the back door, and the main part of the deck on the starboard side chipped (thanks to Steve and Lee of course). Work on this project has been a bit slow of late, on account of other jobs taking priority. If the weather holds this weekend, I'm hopeful of getting the next section wire brushed and primed. Here the Peak Bergen executes a rather neat pirouette right by Lady Jane. That's some impressive piloting, turning such a long vessel in such a small space. I think the Peak Bergen is probably carrying grain. First of all, the supermarkets would have you believe there are two brands, Gillette and Wilkinson, but their blades all look the same to me. So far as I'm concerned, a razor comprises two parts, the handle, which is basically only a small stick, and the blades, which just have to cut my facial hair and not me. Beyond that I don't really care. If the blades are coated in lark's vomit, or whatever it is the manufacturers claim, I just don't care, I consider Mine is an average face which merits no special attention, other than cutting that stubble. Anyway, I bought Gillette blades (£ 10.00 for eight I think) . When I got on the boat I discovered I had a Wilkinson razor and the Gillette blades, of course, would not fit (packaging opened - so no return possible). This was not the end of my world, as I've been through this cycle before, and I've the other brand at home - Even though I don't need blades for it for the foreseeable future. The next week I bought some Wilkinson blades, another £ 10.00 or so for eight of the things. Of course, when I went back to the boat the next week I discovered the blades did not fit the handle. It seems that every few years the design changes so now, like it or not, I more or less had to go and buy a new Wilkinson razor. Back to the shops for a new handle the next week - £ 11.00 or so for a handle and a few more blades. Now I'm over £ 30.00 quid down and awash with spare razor blades and I just know I'm likely to repeat the cycle in a few years time, when I finally run out of blades again. To add a final insult to this whole sorry affair, I slashed my hand when I was opening the new razor packaging. On reflection, it seems far more sensible to consider going electric in future. Here's the next coat going on. 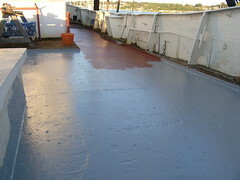 The creamy look I'm seeing heralds a good paint job on the deck. Experience has shown that it's vital to get that second coat on as soon as possible after the first, while allowing 24hrs for the first coat to cure. What seems to happen if the second coat is left too long, is that the rust manages to bleed through the first coat fairly quickly. I suspect there are micropores left in a first coat that are only closed with a second coat. A third coat will go on soon, though this third coat is just by way of making sure the steel is well sealed. So this post should come as absolutely no surprise to anyone who has been following along. As things have worked out, the weather has so far been really kind to me with this phase of the deck project. It looks like I'll get by this next weekend with no rain, and therefore no pools of water on the deck. The significance of this is I should be able to finish rust busting and initial priming of all of the port side of the deck, so I don't have a pool of water, and the subsequent mess, half on and half off my newly primed section of deck. Once I have the deck completely sealed with primer, I'll start work on getting rid of the surrounding concrete, and so get rid of the cause of the pools completely. 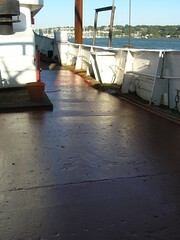 So here's a view of the section of deck I've just finished wire brushing and cleaning up. Pete in answer to your comment, I've learned that exposed steel starts to rust almost immediately, unless the atmosphere is completely dry. So the trick is to get a coat of primer onto the bare steel as soon as is practical. Needless to say, the very next thing I did, after a cup of tea, was to get going painting with the primer. All this work makes for filthy dirty bath water once back at home! What a difference a few days hard graft makes. Here, the picture shows the two phases of my rust busting process. 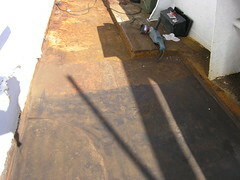 The first layer (top) is the original rusty surface. The last layers shows the steel after attention with a wire brush. After a really good clean, with brushes, vacuum and rags, the steel is then good to paint with the Hemple primer. More sockets are a sure sign that Andy has been. 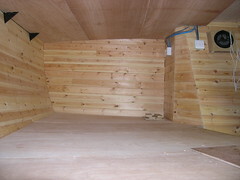 Here you see the improvements to one of the two bunk spaces in the form of a mains socket and a switch for the main light for the occupant(s). Thanks Andy. The fortuitous purchase of an additional light switch means the crew space down below now has three light switches - one by each of the bunks and one up above. Trying to think through, without looking at a diagram, how two switches work together so either switch turns the light on or off is hard enough, but how three work together is really tough. Fortunately we have the internets to help us figure out how stuff works. Like so many puzzles, the answer is easy when you can see it before you. In other news, I've updated the temperature and voltage trackers so it's possible to scroll back through time. I've sill got to fix the internet access reliability issue I'm having, when I get the time. Some time ago I bought some, very expensive, waterproof boots for the boat. My original plan was to get a pair of cheap wellies. In the event I was persuaded to buy a pair of Sebago boots. Now I really don't mind spending good money on quality stuff, especially when my own comfort is involved. Anyway, the supposed waterproof boots leaked, so I took them back. The people at the shop were very good about it, but made me feel it must have been me that was wrong, or that I had done something to them. The shop replaced the boots with another pair of the same type etc. Some time later, when the new boots were needed, I discovered that they also leaked. Because of the journey involved, and the fact that it seemed to be my fault, I did not take them back. Recently, at the boatshow, I spied the Sebago stand and went and asked one of the guys there if their boots were really supposed to be waterproof. He seemed a bit surprised at the question and replied, yes - absolutely. After I explained my issue, he gave me a name and number to call at Sebago to arrange a replacement. Because of my holiday, it was only after I got back that I called the Sebago folks. With absolutely no argument, and an apology, they arranged for new boots to be despatched to me. Apparently there had been a faulty batch and I was just unlucky. After initial testing in the bath last night, my replacement Sebago boots seem just fine. Ahh - comfy waterproof boots at last! 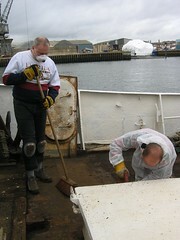 Here you see Steve taking a turn on the Hilti, while Lee manages the broom. Taking turns on the Hilti really helps get the job done. 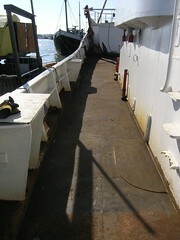 Between Lee and Steve, a good portion of the main part of the deck has now had the first stage of rust busting completed. The difference between the cleaned up steel and the rusty steel is very obvious in the picture. The next stage will be to cleanup the rest of the surface rust with a wire brush, then get some paint on as quickly as possible after that.